After the youth exchange "Music Makes Feelings" in Rijeka/Croatia (read about this project here) we were supposed to come up with some kind of follow-up, to spread the things we have learned and experienced in the project. As the title already suggests, this project was about music connected to feelings. This is why we decided to use social networks to spread music and share which feelings certain songs bring up. What we did was the following: we started a chain to post a favorite song and to share why this specific song is important to you. Some people have connected their songs to their first love, others to a special experience or memory, and some chose a song that makes them happy and cheerful. In any case, music makes all kind of different feelings - and this is what we wanted to show and spread. 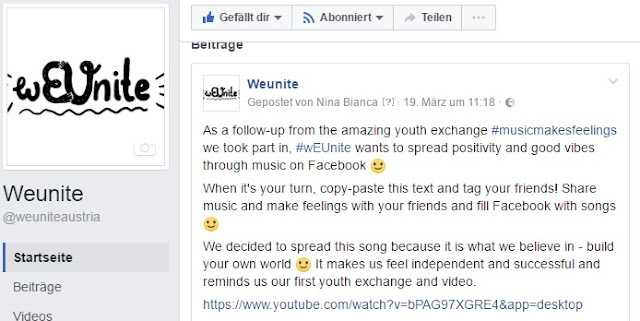 It was a good experience for us to find an idea and try to make it work - we really hope that you listened to some of the shared songs and got positive vibes out of it! Manuel G., Nina, Tini, Marion, Pato, Manuel E.